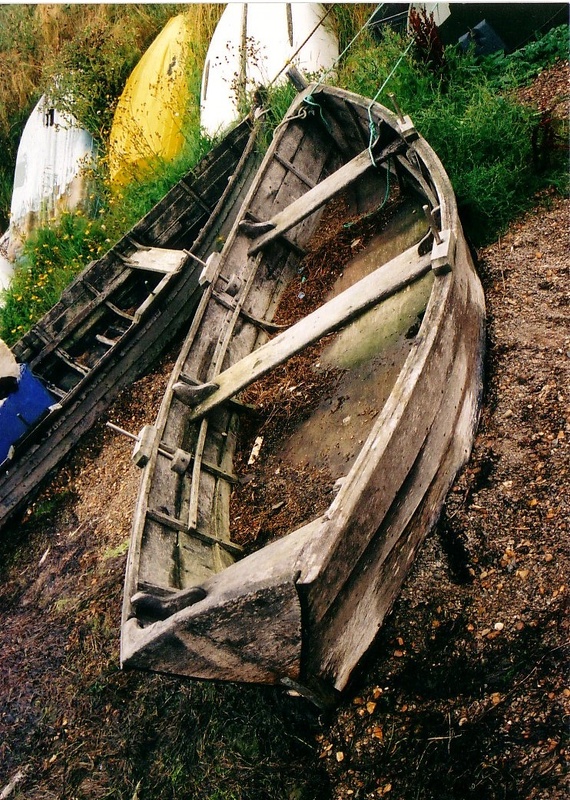 This may be the most unusual and least known boat type we’ve discussed in these pages. 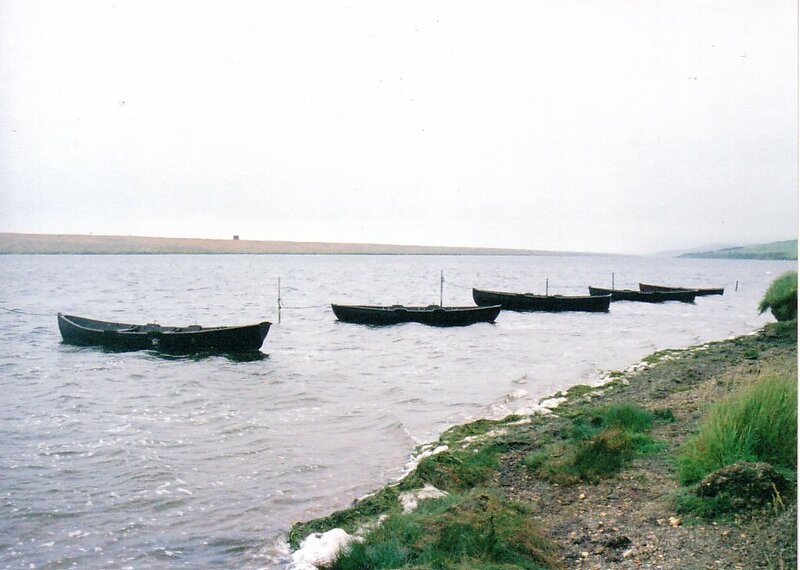 The Fleet trow is designed for use in the often very shallow water of the Fleet, a body of water tucked behind the gravel bank of Chesil Beach. The beach itself is an interesting feature of physical geography and rather overshadows the flash of water behind it. However, this is a place that’s famous in its own right for birds, and for wildfowling from these interesting and heavy flat-bottomed boats. The best known image of a Fleet trow is probably the one in Eric McKee’s Working Boats of Britain – I can’t think of any others that I’ve seen in the magazines or books, but the images above are scans of photos I took of trows on the water and the beach by the Fleet some time ago using a film camera. I’ve got some further images of a trow at a little museum dedicated to Fleet, and I’ll put up some scans of them some day. The boats are heavily built, as you will see from the photos, and have no rocker fore-and-aft. They are powered either by very old-fashioned square-section oars that mount on the thole pins you will see in the photos or a quant when in weedy water. The oars themselves are interesting because they are counterbalanced by a weight called a ‘copse’. Very interesting. There's a similar strectch of water in Spain, on the south side of the river Ebro delta called El Port d'Alfacs, it's shallow and sheltered behind a long sand bar. The local craft, also built for rowing, bear a resemblance, again heavily built but carvel I think, and with a narrower transom. I'll try and get some photos. 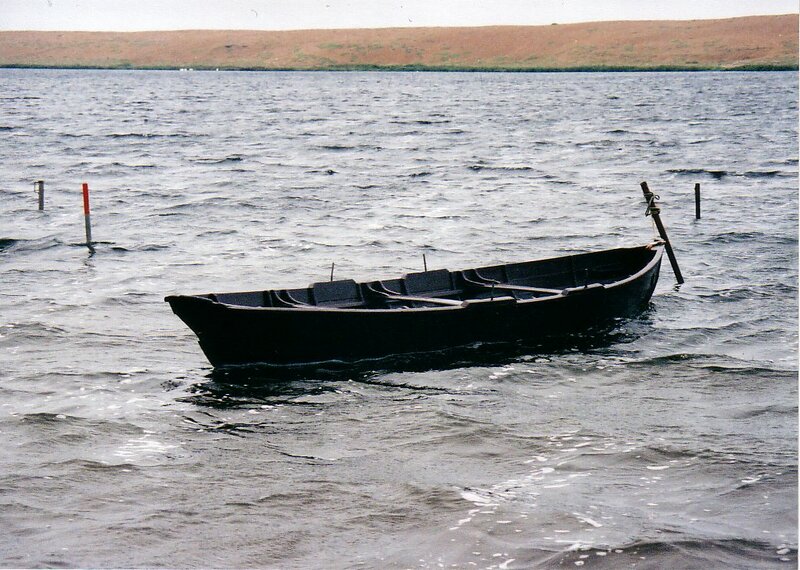 Troe is the local pronunciation of Trough and is a very good description of the boats. The shape is determined by the curved elm branches that came to hand for the 'knees', the naturally grown bends, usually about 100 degrees of angle, that give the boat it's strength and resilience. These 'grown knees' would form (1) the Bough(bow)s, sometimes at both fore and aft. (2) The ribs, that would be in pairs cut from the same grown bend so that they matched. (3) the Thwart (seat)Knees that fixed the thwarts to the gunnel and top board of three(usually) that formed the sides. Straight cleats would be placed across the bottom for stiffening, spaced out along the bottom between the ribs. 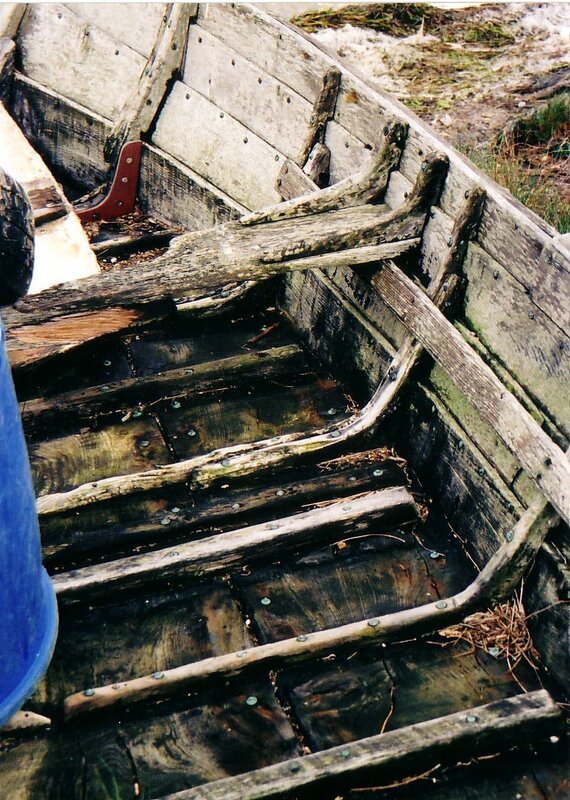 The gaps at each end of the cleats and between the pairs of ribs, allowed any water to flow to the rear bong-hole when the boat was out of the water. Cleats would be positioned for the oarsman to push against with his feet when rowing. 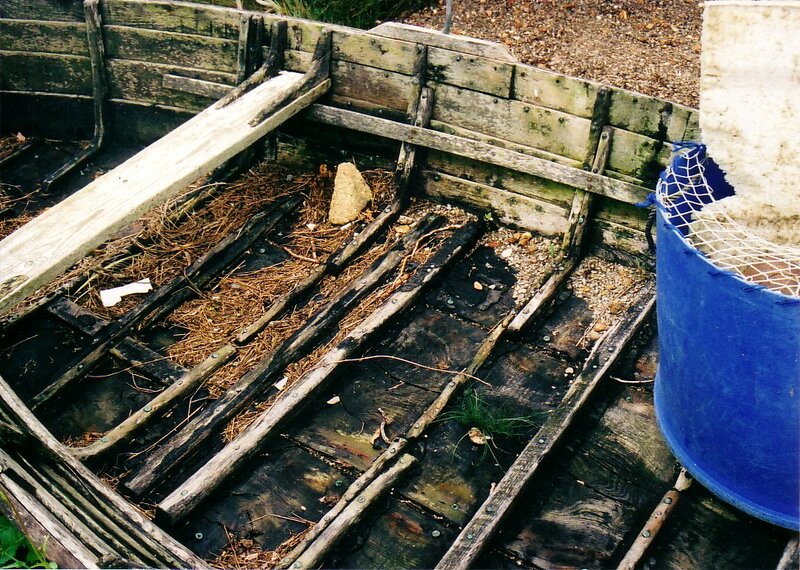 Inside the bottom board, at the bough, there was often a short board fixed, to stop the bottom board being rubbed away by hob-nailed boots when the vessel was being used for eel pecking(spearing using a trident). 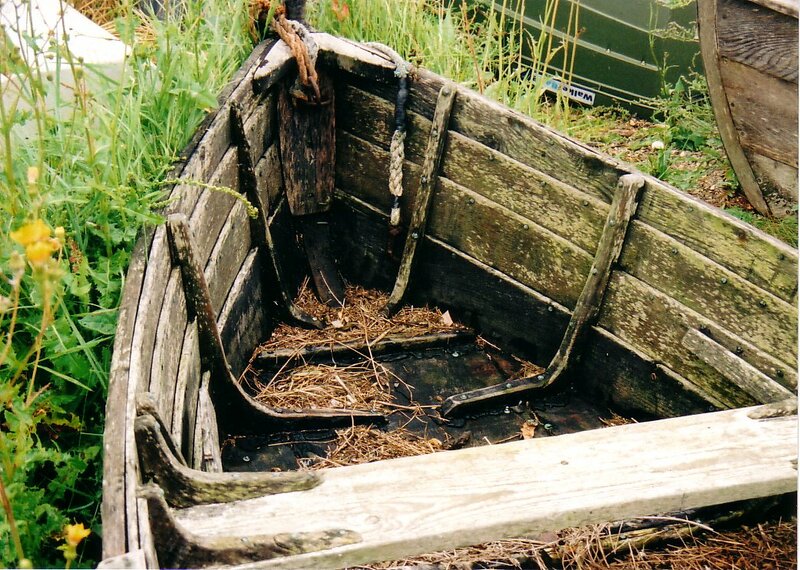 Because each boat was built around the grown knees available(the grain travelling the whole length of the knee), no two troughs should be exactly the same shape. Thanks for this Jim – it's most interesting. You’ve missed the point of these boats. 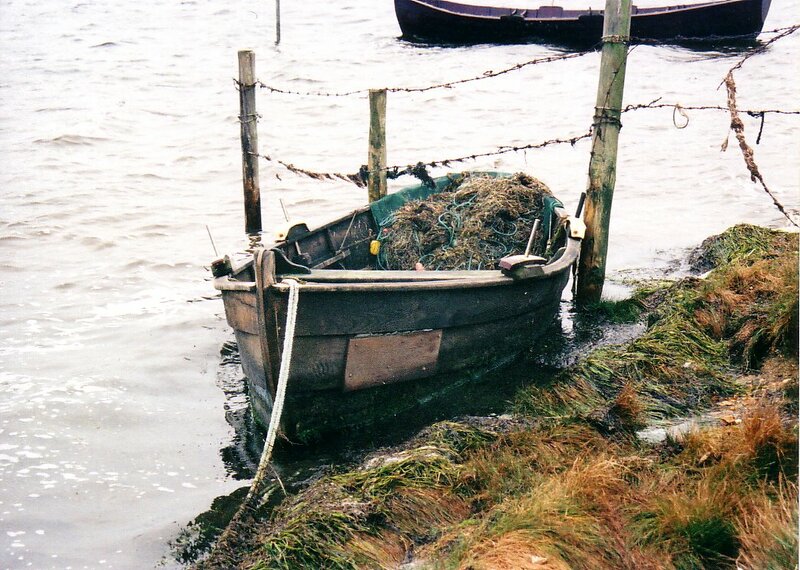 In the 1900s to the 1970s the trows were used for wild fowling only occasionally. The main use of these vessels was for the transportation of mackerel caught in purse seines from lerrets in the Chesil. Typically a large trow would carry up to 40 stone of fish in 2 stone wooden boxes. The quant was used so that the boat could be used fully loaded with the quants man stood at the back. The oars were not used when transporting fish. The heavy flat bottom allowed large numbers of fish boxed to be stacked on the floor and beached in ankle deep water. Weed has nothing to do with the design of the boat or the quant as the fleet is almost entirely populated with eel grass. 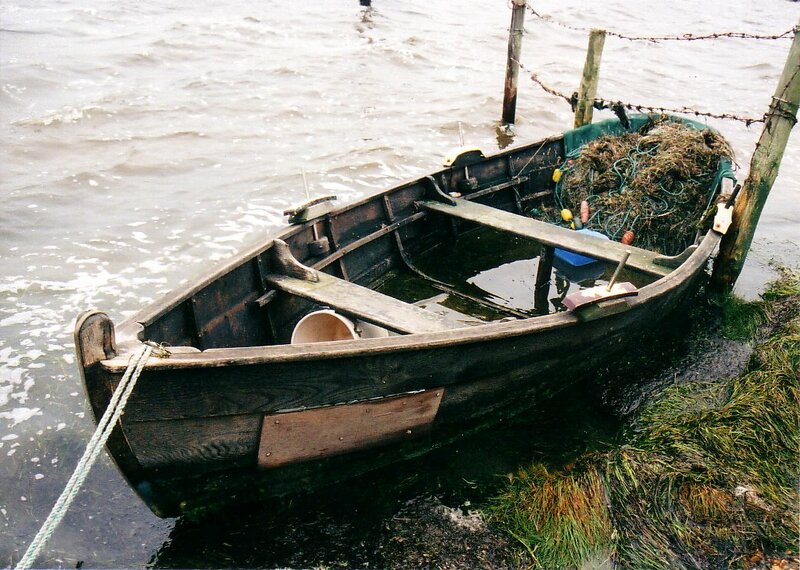 Occasionally in the winter the the boats were used for wildfowling but in the 60’s this was declining on the fleet as licenses were withdrawn and not reissued as wildfowl’s died. I recollect this being the case with my grand father. He used a short punt light canvas skinned punt to shoot widgeon and teal as it was lighter and made less disturbance in the water. A number of fishermen used the trows in the winter to fish for balsam eels which they speared in the mid with a 7 bladed fish spear. The eels were saved in wooden ‘ollies’ fixed to stakes in the middle of the fleet and collected by the wholesaler Greenslades of Poole who took them to Billingsgate. Most of the trows were tarred but in the 70’s as the mackerel fishing declined a few were made with varnish finish to the ridicule of the older fishermen. To the best of my knowledge the majority of the fleet trows were made by Ron Berry in his Chickerell boat yard. I recollect helping my grandfather and Ron building on one of the last trows in the 1970s. I hope that this adds a little to the understanding of the construction of these work boats.There are an odd few still on the bank at Park Wall near to the Moonfleet hotel. Many thanks for that. We really only know what we can read or people tell us!